A well-rounded pork belly was had for EoY Christmas lunch at The Stables Bar. Racked with indecision between this and the choice of a 300g Angus beef steak, I went the pork belly. That’s two out of two years I’ve gone for the pork belly at the EoY lunch. And two out of two pork belly hits. Out from the kitchen, with relative speed, came a large piece of tender belly surrounded by crackling sat on chickpeas and a pink sauce. It came complete with the wow factor. The big portion of pork was fall-off-your-fork tender. It was lacking somewhat in smoothness and flavour. The crackle had sufficient crispiness and the fat had been rendered off well. More salt was needed, if anything. The chickpeas and sauce provided good moisture, while the salad added a freshness that paid dividends. It was a main that ticked all major boxes. 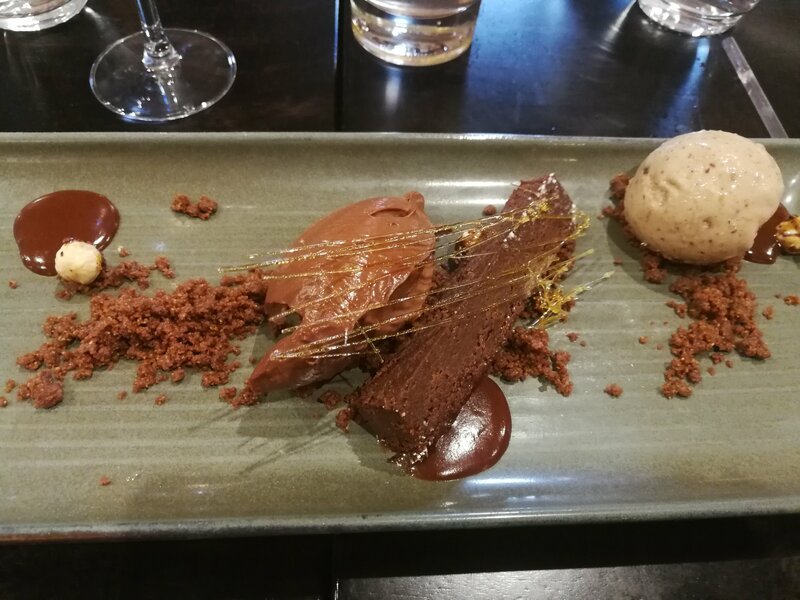 Dessert was a choice between a chocolate mousse with a chocolate brownie and ice-cream, a passionfruit cheesecake, and a cheeseboard. While I’m usually partial to any sort of cheesecake on the menu, this time I was all in with the chocolate. The stiking gold sugar net, brownie log, shiny mousse, chocolate crumble and icecream looked incredible. The brownie was gloriously fudgey, and the mousse, thick and smooth. They were a chocolate bomb to the palette, diffused only by the crumble, the sauce, and the ice-cream. Refreshing, textural elements that drew away some of the sweetness and decadence. This was chocolate hit delivered like a postman on a mission. A great dish. Taste verdict A great Xmas lunch. No word of a lie when I say the pork belly made a few people jelly. The chocolate dessert was the bomb. Highly recommended.